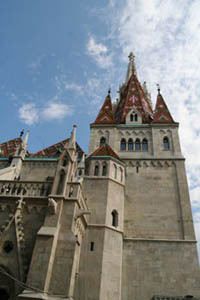 The slender main tower of Matthias Church in the heart Buda Castle can be seen from many parts of the city. and witnessed many turbulent events of Buda. King Béla IV. founded the Roman Catholic church, also known as Church of Our Lady (Nagyboldogasszony templom), after the Mongol invaders left Hungary in 1242. Opening hours may change because of religious ceremonies. Sun: 13.00 – 17.00, on religious holidays opening hours vary. Note: Once a year, on Holy Saturday (the Saturday before Easter), the church can only be visited by worshippers. The ticket is valid for visiting the Church and the Museum of Ecclesiastical Art (Egyházművészeti Múzeum) in the crypt. Tours start at every hour, max 15 persons can go up. Tickets: 1-5 persons: 2 500 HUF, 6-45 persons: 6 000 HUF. Smoking, eating, drinking, taking dogs or other animals is not allowed. Please wear clothes appropriate for the place: shoulders, thighs shall be covered! Please take off your hat, cap! Do not use mobilephones please! Taking photos inside the church is allowed even with the flash on. Please avoid using flash in the upstairs exhibition halls and exhibitions displaying textiles! Enjoy wine tasting in Budapest’s oldest wine cellar situated within the Hilton Hotel. Choose from 4 wine tasting menus that include the best of Hungarian reds, and whites from the Szekszárd, Villány, Eger, Tokaj, and Somló wine regions of Hungary. According to historians a church referred to as Church of Mary stood at the place of the current edifice that was founded by Szent István (Saint Stephen) the first king of Hungary in 1015. There’s no archaeological evidence of this early church though. The earliest remains of the church dates back to the 13th century when King Béla IV. (1206-1270) commissioned building of a church at Castle Hill after the 1241-42 Mongol invasion. The north tower was built at that time (1255-1269). The oldest part of the building is the Mary Gate (Mária Kapu) at the south entrance was built by King Nagy Lajos (1326-1382) of the Angevin dynasty in the 14th century. The magnificent Gothic stone carving depicts the Assumption of the Blessed Virgin Mary. Frigyes Schulek reconstructed the gate using parts that survived World War II. King Sigismund of Luxembourg (Luxemburgi Zsigmond: 1368-1437) enlarged the church. 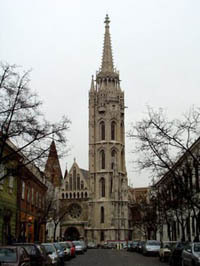 His wedding to Cillei Borbála was held in the church. The name of the church refers to King Matthias Corvinus who expanded and embellished the building in Renaissance style. Matthias was a much revered ruler of the era and was one of the greatest kings of Hungary. He was very fond of the arts and sciences and invited famous artists from abroad to help establish Renaissance enlightenment in Hungary. His royal court was famous even in Western Europe and visitors often praised the magnificence of his royal palace. Matthias was crowned to king of Hungary in the church and his two weddings (the first to Katherine of Podiebrad, the second to Beatrice of Aragon) were also held there. Read more about King Matthias and his reign. 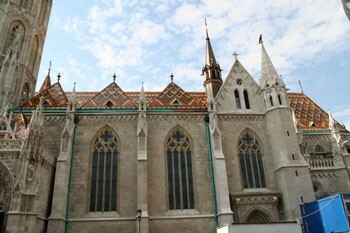 In 1541 the Turks occupied Buda and turned the Church of Our Lady into a mosque. Many artifacts were taken away by them, the beautiful frescos were whitewashed, and ornate furnishings were destroyed and discarded. By the end of the siege of Buda in 1686, not much survived the Ottoman years. A new church was constructed of the remains in Baroque style. In the early 18th century the church suffered more damages and it was finally restored in Neo-Gothic style by Frigyes Schulek in 1873-96. The exterior and the frescos originate from this era and are the works of Hungary’s greatest artists of the time (Károly Lotz, Bertalan Székely, Mihály Zichy). The marvellous stained glass windows on the south elevation are the finest examples of the talents of these artists. The oldest part of the church at the foot of the bell tower in an atrium dates from the 14th century. This is the only real Gothic piece, others our reproductions by Frigyes Schulek. Parts of the gate include signature marks of craft unions of 14th century stone carvers. 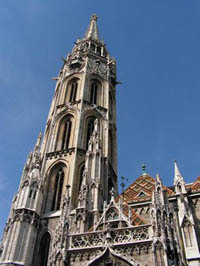 The highest spire (60 m) of the church. The 5 floors are from the 13th-15th century while the top with jagged stone carvings, a balcony and balustrades are the work of Frigyes Schulek from the 19. century. On the third floor of the tower, on the southwest side, there is a duplicate of the shield of King Matthias placed there in 1470. The original is on display inside the church. 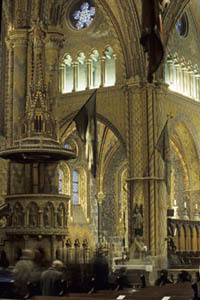 The church bells are hanging in the chamber behind the shield. Only three of them survived; the biggest one weighs 3.2 tons and can tolls at noon. TIP: You can climb up to the lower terrace (at 47 m) of the Bell & Lookout Tower on 197 steps at and enjoy the fantastic panorama. The renovation of the tower was finished in 2015 and opened to the public on 21. October 2015. Opening Hours: 10.00 – 17.00 every day, tours start at every hour, max 15 persons can go up. Admission: full price: 1800 HUF, students/retirees: 1 200 HUF, free for children under 6 years of age. It received its name after King Béla IV., the founder of the original church. 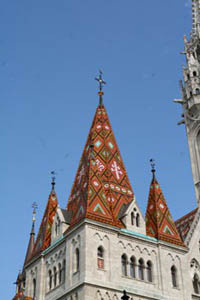 Multicolored roof tiles cover the building some of which retained its original Gothic style. The altar is in the middle of the main chancel and is the work of Schulek. It is at the end of the northern aisle. Fresco scenes by Károly Lotz depict the highlights of the life of King László (1077-95). The chapel is next to the chancel and was built by Frigyes Schulek in neo-Gothic style. The seven frescos of St. Stephen on the walls and twelve windows showing Hungarian saints are all masterpieces by Bertalan Székely. demonic animals fighting with each other. Awinged altar painted by Károly Lotz depicts the victory at Nándorfehérvár and the tradition of noon bell commemorating the event. There is an exhibit about the history of the Holy Crown. A replica of the Holy Crown of Hungary and other coronation medals are also on display. These objects may seem to be cheap copies, especially compared to detailed photos of the original crown, but they were made back in 1966, on the basis of photographs only, as the Crown was “held hostage” in America, and until its return in 1978, Hungarians could only went to see these copies as pilgrims. a fresco by Károly Lotz showing the coronation of Francis Joseph in 1867 are the highlights of the chamber. It is next to the main entrance. A Baroque statue of the Virgin Mary with Christ stands here, to which Buda’s miraculous recapture by the united Christian army in 1686 is attributed. According to the legend, when the Turks put Buda castle under siege, people walled in the statue inside the niche. The Turks didn’t find it. In 1686 an explosion demolished the walls around the statue revealing the Virgin’s shining face. The Turks took this as a bad omen so they gave up this part of the castle without fight. Szent Imre, son of King St. Stephen and heir to the throne, was killed by a wild boar at young age. The altar of the side chapel shows scenes form his life. The remains of the royal couple were brought here from Székesfehérvár Cathedral in 1860. It includes part of the Museum of Ecclesiastical Art. The crypt can be accessed by steps to the right of the main altar. The collection contains monstrances, chalices and other treasures of religious importance. The exhibit starts in the crypt and leads up the St Stephen Chapel. Admission is included in the church entrance fee. The church frequently houses organ concerts. 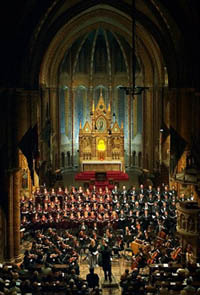 The Matthias Church Choir and Orchestra is one of the oldest music companies in Hungary, operating continuously from 1688. The organ of the church was built by the Rieger Kloss factory in the Czech Republic in 1909 from a donation of Franz Joseph emperor. TIP: You can enjoy free organ recitals in the Church, presented by its choir and soloists once in every month usually on a Sunday. The Hungarian Virtuosi Orchestra gives concerts around twice a month (usually on Saturdays). Tickets are available in various price categories, starting from 3 900 HUF. 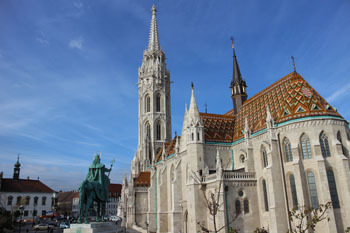 Find concert dates and tickets to Matthias Church! 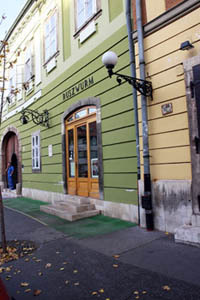 Address: Szentháromság tér 2., Buda Castle, district I. The program features works by famous composers such as Vivaldi, Bach, Albinoni, Mozart, Sibelius, Bizet etc. For concert dates see also the concert schedule on the official site of the church. Fishermen’s Bastion (Halászbástya) – designed by Frigyes Schulek between 1895-1902 in neo-Romanesque, neo-Gothic style. The 7 towers represent the seven tribes of Hungarians when they settled down by the Danube in the Carpathian basin in 896. Fishermen’s Bastion never was used for military defensive purposes, it was created for only decorative reasons. 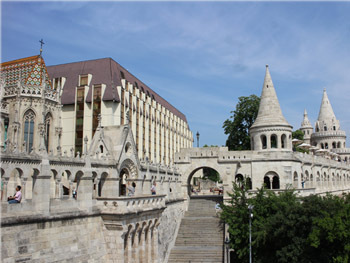 The building has many turrets, terraces, parapets and stairways offering an exceptional view of the Pest side and the river Danube. There’s a small entrance fee (cc. 350-700 HUF) if you want to go up the terraces. You can take a rest in the cafe at the southern end during the tourist season. A bronze statue of King St Stephen stands next to the bastion. Tárnok utca houses the Castle District’s oldest pharmacy that opened in 1745. You can learn about the history of pharmacies, see original furnishings and tools of a medieval pharmacy. Admission: adults: 800 HUF, students, retirees: 400 HUF, free for children under 6 years of age. TIP: see a list of other museums in Budapest. The Pharmacy Museum building’s foundation is from the Middle Ages. Ruszwurm (Szentháromság utca 7., Open: every day: 10.00 – 19.00): Claims to be the oldest confectionery in the city. Offers creamy tortes (Dobos torte), cakes and pastries, ice cream in summer (a scoop costs 250 HUF), coffee, tea and various other drinks that you can enjoy on the terrace in good weather. Read more about Ruszwurm Cafe. Gelateria No. 7. (Szentháromság utca 7. ): Right next to Ruszwurm, serves delicious, Italian-style gelato (a scoop is 250 HUF), coffee, ice coffee, fruits juices, sandwiches, some cakes and desserts. Jamie’s Italian (Szentháromság utca 9-11.) Open: every day: 11.30 – 23.00): The famous British chef’s ristorante serving typical Italian dishes: freshly made pasta dishes, pizza, kids’ menu, seafood. It has a small terrace. Walzer Cafe (Táncsics Mihály utca 12., Open: every day: every day: 10.00 – 18.00): One of the best places for good espresso, cappuccino of other coffee drinks. Fresh, roasted coffee beans from various parts of the world are used. Rétesvár Strudel Shop (Balta köz 4., Open: every day: 08.00 – 20.00): This small bakery shop specializing in traditional strudel is in a narrow passage way between Tárnok utca and Úri utca. 21 Magyar Hungarian Restaurant (Fortuna utca 2., Open: every day): 12.00 – 24.00: One of the best places to enjoy the delights of Hungarian cuisine and sip Hungarian wines. 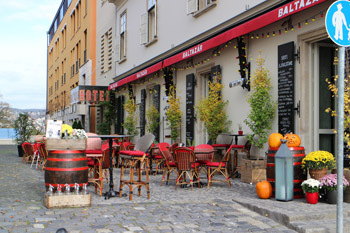 Pest Buda Bistro & Hotel (Fortuna utca 3., Open: every day: 07.00 – 23.00) – Specializes in traditional Hungarian dishes like beef goulash, paprikash 8from catfish or chicken), and stuffed cabbage. 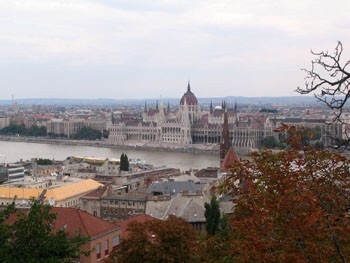 Being a major tourist attraction of Budapest, the Castle District offers some good hotels to stay at. The St George Residence Hotel in Fortuna utca is ideal for a romantic stay. This historic boutique hotel is housed in a renovated Baroque house built on medieval foundations. Suites in four categories, a Gothic style restaurant, cafe & bar and a wine cellar ensure complete relaxation in a historic environment. The Hilton Budapest Castle District stands right next to the Church. The hotel building includes the restored remains of a 13th century Dominican cloister that hosts concerts in the summer. See other 5-star hotels in Budapest. 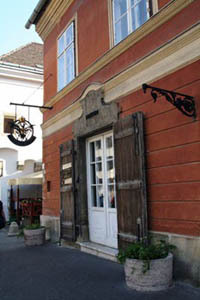 Address: Országház utca 31., district I. This small luxury boutique hotel with unique interior, comfortable rooms and fine view opened in 2013. Each room features a different interior decor inspired by Vivienne Westwood and Andy Warhol. premium L’occitane cosmetics are provided. The hotel also has a very good restaurant/grill bar offering simple, tasty bistro meals: a selection of tapas, Hungarian classics, gourmet burgers, fish and vegetarian dishes at reasonable prices. There’s also breakfast and homebaked pastries from 7.30 to 10.30. You can enjoy your meal or a glass of wine, the pleasant surroundings on the lovely terrace. Find out more about Baltazar Hotel. This boutique hotel at the foot of Castle Hill has excellent location. It also offers convenient accommodation in modern style rooms. Read more about Lánchíd 19 Boutique Hotel. See more Boutique Hotels in Budapest.